Northern Ireland manager Michael O'Neill acknowledges that his side must make the most of their opening two fixtures if they are to qualify for Euro 2020. Estonia and Belarus will both travel to Windsor Park next week for games on Thursday and Sunday. "If you look at it in terms of the group, these are the two easiest fixtures," said O'Neill. "We have to get points on the board and we have to get momentum." 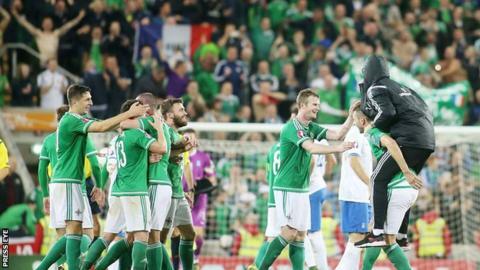 Northern Ireland will then play away fixtures against the same two teams in June before ending their campaign with four games against Group C's top two seeds, the Netherlands and Germany. In 2016 O'Neill led his side to their first European Championships after they topped their qualifying group in which they collected maximum points from the opening three games. "What lies ahead with Germany and Holland are markedly bigger tests for us," admitted O'Neill. "These opening two games give us a chance to get points on the board, we have seen the benefits of doing that in the previous campaign." Some of Northern Ireland's most experienced players including Gareth McAuley and Kyle Lafferty are currently struggling for game time at their clubs. Captain Steven Davis was a peripheral figure for Southampton for the first half of this season but has seen more action since returning to Rangers on loan in January. "The squad possibly isn't where we would like it in terms of players playing for their clubs but the lads can leave the issues at their clubs behind them and have a positive week," said O'Neill on Saturday. "A lot of the lads have been spending a lot of time sitting on the bench since the turn of the year so that's frustrating for them and frustrating for me and the scouting team as well. "Hopefully they will have a few more minutes in their legs for the games that lie ahead. "Steven's performances in September, October and November for Northern Ireland were of a high standard so hopefully he will bring that form with him. Sometimes players need a little bit of time to settle in with their clubs." With right back Michael Smith injured and Conor McLaughlin returning from a lengthy injury, it is unclear who will fill the position on Thursday. Middlesbrough's Paddy McNair has featured there before as has veteran defender Aaron Hughes. "This may be the hardest team I have had to pick in quite some time," said the manager, whose most recent squad contains 16 players who were also part of the team that travelled to Euro 2016 in France. "It is nice to see the young players in the squad but they are at a stage where we have to be careful we don't ask too much of them as well." The Northern Ireland squad announced last week included a first senior international call-up for 19-year-old Arsenal defender Daniel Ballard. Regular starting midfielder Oliver Norwood asked to be omitted for "personal reasons", while Nottingham Forest's Jamie Ward has been placed on stand-by. "Jamie has not played any first-team football since before Christmas so it would be very difficult to ask someone to step in in that scenario - it would be a big ask for him to come in and perform at this level. "Ollie has been a mainstay in the team since I took over and he has more than 50 caps but players make decisions and at this minute in time Ollie has asked to step away from it. "He has chosen to make himself unavailable for personal reasons and we have to respect that. "In the case of Daniel he is in the squad for experience and it's a chance to see what he has got. "He has shown up well at international level and I think bringing in a young player like Daniel is more beneficial than bringing in a player in their 20s or 30s who may be playing lower league football."